Mature males average at 16 metres (52 ft) in length but some may reach 20.5 metres (67 ft), with the head representing up to one-third of the animal’s length. The sperm whale feeds primarily on squid. Plunging to 2,250 metres (7,380 ft) for prey, it is the second deepest diving mammal, following only the Cuvier’s beaked whale. The sperm whale’s clicking vocalization, a form of echolocation and communication, may be as loud as 230 decibels (re 1 µPa at 1 m) underwater, making it the loudest sound produced by any animal. It has the largest brain of any animal on Earth, more than five times heavier than a human’s. Sperm whales can live for more than 60 years. 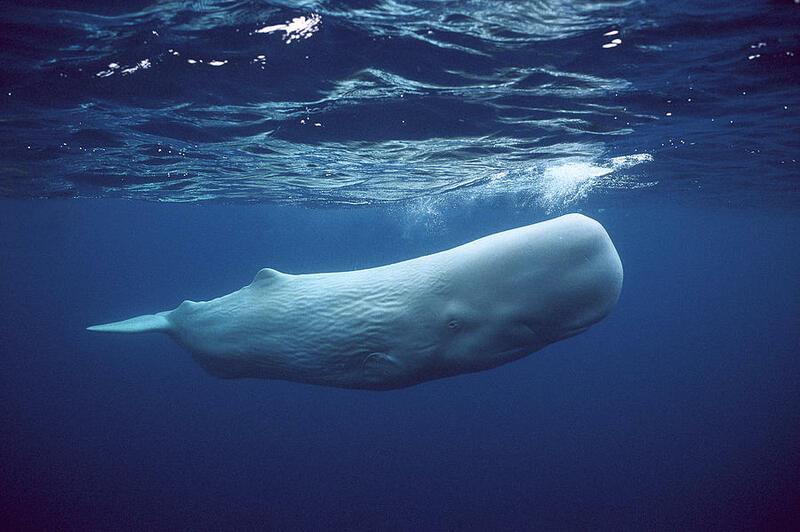 The sperm whale can be found anywhere in the open ocean. Females and young males live together in groups while mature males live solitary lives outside of the mating season. The females cooperate to protect and nurse their young. Females give birth every four to twenty years, and care for the calves for more than a decade. A mature sperm whale has few natural predators. Calves and weakened adults are taken by pods of orcas.